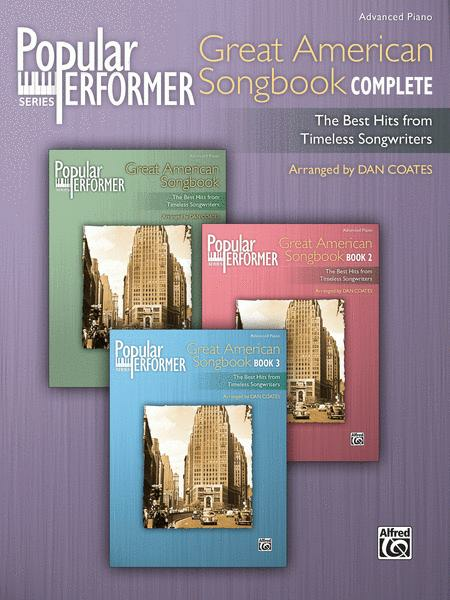 Some of the most famous selections from the Great American Songbook are included in this collection. These classic favorites, masterfully arranged by Dan Coates for advanced piano, sound rich and full and will delight audiences as well as provide hours of enjoyment for hobbyists, advancing students, professional musicians, or any "popular performer." Titles: Anything Goes * Cry Me a River * The Days of Wine and Roses * Dream a Little Dream of Me * Embraceable You * Falling In Love with Love * Fly Me to the Moon * Fools Rush In * I Get a Kick Out of You * I Got Rhythm * I Only Have Eyes for You * I'm in the Mood for Love * In the Still of the Night * It Had to Be You * I've Got You Under My Skin * The Lady Is a Tramp * Long Ago (And Far Away) * Love Is Here to Stay * Make Someone Happy * My Funny Valentine * On the Street Where You Live * The Shadow of Your Smile * Singin' in the Rain * Skylark * So In Love * Someone to Watch Over Me * Stardust * Summertime * They Can't Take That Away from Me * When I Fall In Love * Where or When * With a Song in My Heart * You'll Never Know. Alfred's Popular Performer series includes collections of pop, jazz, Broadway and movie music. Each selection is masterfully arranged for Early Advanced to Advanced pianists. Rich textures, sophisticated harmonies and inventive rhythms make these arrangements ideal for hobbyists, advancing students, professional musicians or any Popular Performer! but easy to read, distance between notes very readable, number of pages per song not excessive like other publishers. The music is not as difficult as those in the Dan Coates Pop Keyboard Library or Dan Coates Complete Advanced Piano Solos. Great song selection that will keep you interested and maybe enthralled enough to keep you practicing. Spend $5 plus some gas and have it rebound with a spiral binding at a UPS or similar store, which will allow the pages to stay open. If not busy they can have it done in less than ten minutes and it's well worth it. Enjoy the book! Dan Coates, the arranger, has become my favorite. The songs in this book are popular tunes and the arrangements are top notch. They are both rich sounding and highly playable. Highly recommend.